Plugins can be an essential part of mixing any song whether you’re adding reverb or cutting out the sibilance of someone who loves their consonants. Software companies have made a name for themselves in the plugin market by offering a wide range of incredible tools for shaping your tracks, many times emulating famous hardware effects. Aside from choosing which plugins you want to use, you have to choose whether to run them natively—using your computer’s built-in processing power—or externally via dedicated digital signal processing (DSP). Many musicians, producers and engineers might think they need external DSP to power their workstations and record and mix with the lowest latency. Offloading audio plugin processing from your computer to external DSP is wise when your computer’s CPU is simply not capable of running all the plugins you need or if the processing required is negatively affecting the recording system’s performance. The idea of having additional horsepower available—via external DSP—to run whatever plugins you want might seem like an ideal solution for many modern recording engineers. However, computers have become extremely powerful over the last decade and plugin developers are constantly improving their software to be more CPU efficient. The combination of these two things means that today’s computers can handle more audio plugins than ever before. Recording and mixing on the go can be beneficial to an engineer’s time and being tied down to extra equipment can prevent that. So do you really need external DSP? Will it give you the hefty power you need for fulfilling all your audio plugin dreams? With two nearly identical sessions running on two separate computers—one utilizing external DSP to run DSP based plugins, one running Waves plugins natively on the Mac—we tested each system’s performance with comparable plugins from each manufacturer.. In both scenarios, a Logic Pro X session featured 15 mono audio tracks and 1 Aux track. 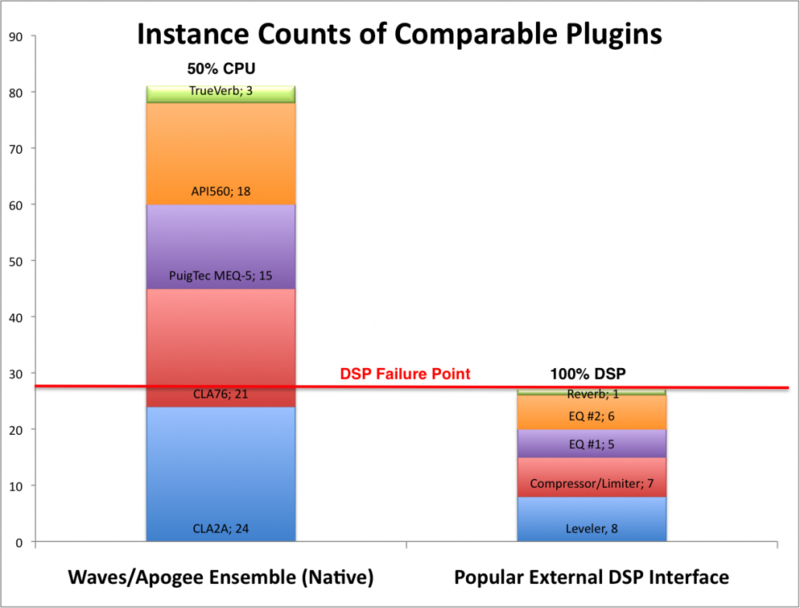 Through the popular external DSP interface, we were able to successfully run a total of 26 instances of 5 different DSP based plugins before the DSP capabilities of the system reached its limit. 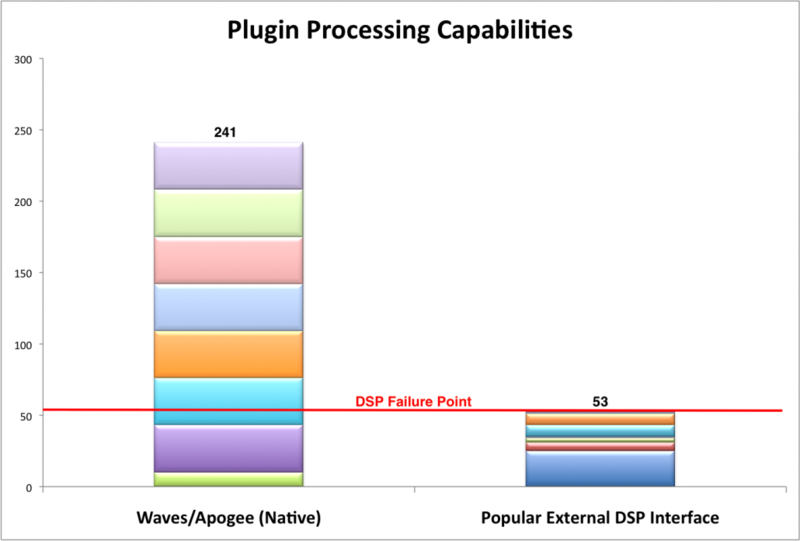 When we attempted to add a 27th DSP based plugin, a popular compressor, the DSP bandwidth was exceeded and the plugin was automatically disabled..
With the same session running through a MacBook Pro* and Ensemble Thunderbolt interface at a 32 sample buffer size, we added the same number of comparable Waves plugins (detailed list of plugins included below) to the same tracks as above at the DSP Fail Limit. While listening to the playback for several hours, the CPU usage meter in Logic was barely moving and we experienced no noticeable issues. We then doubled the number of audio tracks and plugins to see if we could find the breaking point. With 30 audio tracks, 2 Aux, and 54 instances, our Logic CPU usage meter only ever reached 30%. We then decided to triple it with 45 audio tracks, 3 Aux, and 81 instances of the 5 correlative Waves plugins and we were barely hitting 50% on the Logic CPU usage meter during playback. The native system was able to run the same tracks, with comparable plugins and triple the audio. How Far Can a Native System Go? Using a 2013 MacBook Pro, we loaded up a Logic Pro X session with 33 tracks and started playing back through an Ensemble Thunderbolt. Buffer size was the minimum, 32 samples, and the sample rate was 44.1kHz. We loaded up each track with a collection of some of our favorite Waves plugins to see if it would be able to successfully run it all at once. It’s also good to note that the computer used for this experiment is not the fastest on the market. The newer MacBooks have faster processors and provide more power that the one listed below. So if you’re working with a computer released in the last year, your limit might exceed this test. Even after 175 instances of plugins, the session still ran smoothly. So we kept going, determined to find the breaking point. The Logic CPU usage meter said we were close to the maximum, however it was still running fine as far as we could see and hear. After adding X-Noise and SoundShifter pitch to every track, there was the occasional hiccup while recording so that’s important to note. These two plugins require a significant amount of CPU load on top of every other plugin already used. We had our engineer mix the same session using the DSP plugins comparable to the Waves plugins he would normally use. This way we could measure the potential for a real world application. Through this test, we observed most Macs can handle a session with plugins just as well and even better than an audio interface with DSP, even when the DAW buffer is set for the lowest latency. If you were to run Waves natively you could use any interface, take your mix anywhere, and not worry about maxing out your CPU so early. Is it going to handle every situation? No. If you’re using a lot of virtual instruments, for example, it’s going to be a heavier burden on your CPU. However, the majority of people will find it very difficult to max out. Don’t take what you read online at face value. When deciding on an audio interface, look beyond the DSP discussion and DSP dependent plugins. 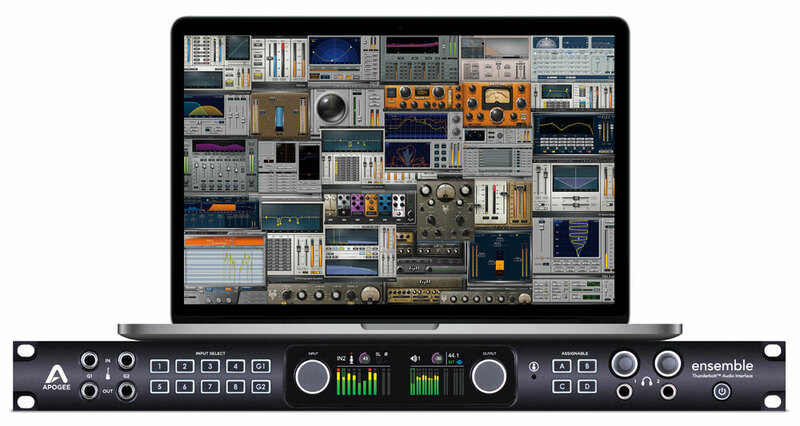 Powering your sessions and plugins—that’s your Mac’s job. If your Mac isn’t powerful enough to handle your processing power, consider upgrading your computer. With technology constantly evolving, you find yourself having to upgrade your old systems. Rather than upgrading both a DSP interface and computer, consider spending more money towards the computer to avoid paying thousands of extra dollars over time. Spend your money on great sound quality and choose an audio interface with the best performing AD/DA conversion and mic preamps and high quality, CPU efficient plugins.